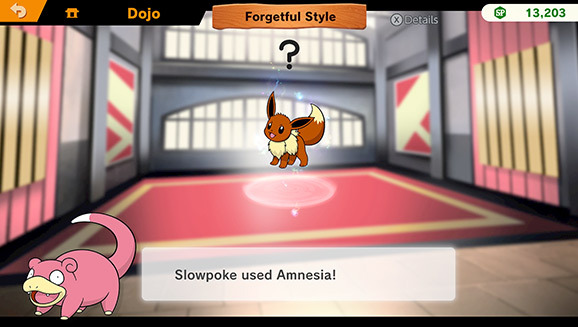 Celebrate Pokémon in Super Smash Bros. Ultimate. Check out some of the amazing Pokémon appearances and features in the latest iteration of the world-renowned fighting game franchise. 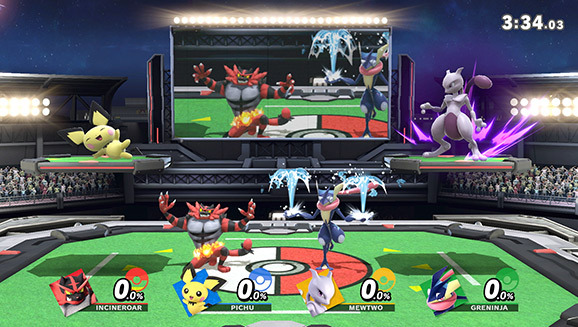 The popular Super Smash Bros. series of fighting games is a special one for Pokémon fans. In this impressive celebration of the Nintendo video game universe, Pokémon has always played a central role in the festivities. As a result, these games have become excellent opportunities to enjoy Pokémon in a unique and exciting way. The recent Super Smash Bros. Ultimate for Nintendo Switch packs in more Pokémon characters and content than ever before. Join us as we explore some of what this must-have title offers for Pokémon fans. 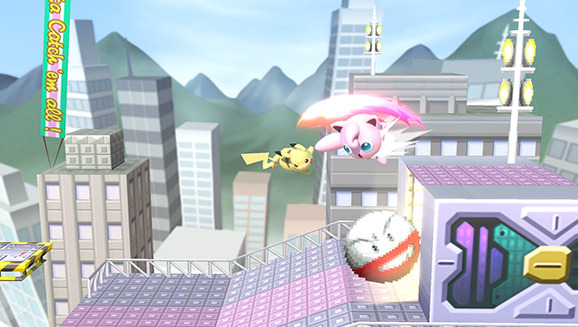 The original Super Smash Bros. for Nintendo 64 marked the first time that Pokémon made the jump from turn-based battles to real-time combat, with Pikachu and Jigglypuff as the debut Pokémon contenders. The series has come a long way since then, with a wide assortment of fighters from the Pokémon universe appearing in Super Smash Bros. Ultimate. The returning Pokémon Trainer can send out Squirtle and Ivysaur, as well as Charizard, which is back at the Pokémon Trainer’s side after its previous standalone appearance. We’d like to believe that this Charizard merely decided to disobey its Trainer for a little while, much like Ash’s Charizard did in Pokémon the Series. With such a wealth of playable Pokémon to choose from, you’re bound to discover at least one that suits your fighting style. Powerful Pokémon such as Lucario and Greninja also return as fighters, as well as a feisty contender you might not expect—Pichu. Not seen as a playable character since Super Smash Bros. Melee for Nintendo GameCube, this adorable Pokémon battles in a manner similar to Pikachu, but with a few key differences. Notably, Pichu’s Electric-type attacks often deal more damage, but they hurt Pichu with recoil! 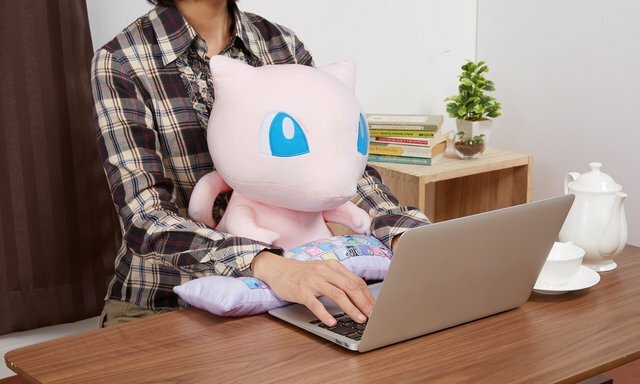 Don’t underestimate it, though—after all, what other Pokémon that small and cute can hold its own against a Legendary Pokémon like Mewtwo? The newest Pokémon fighter to join the fray is none other than Incineroar, a close-range, heavyweight fighter who bears some similarities to the Masked Royal’s Incineroar from Pokémon the Series: Sun & Moon—Ultra Adventures (as seen in the episodes “Pushing the Fiery Envelope!” and “A Young Royal Flame Ignites!”). Incineroar unleashes ferocious attacks like Darkest Lariat and Cross Chop, as well as Alolan Whip—a move exclusive to Super Smash Bros. Ultimate—which throws an opponent against a set of ring ropes. Keeping with the wrestling theme, Pikachu Libre makes its Super Smash Bros. debut as an alternate costume for Pikachu. Considering its role in Pokkén Tournament DX, its inclusion in thisfighting game seems like a no-brainer. With such a wealth of playable Pokémon to choose from, you’re bound to discover at least one that suits your fighting style. A huge new feature in Super Smash Bros. Ultimate is spirits—game characters that can often be equipped before battle to augment your fighter’s abilities. Pokémon has over 150 spirits featured in the game—more than any other franchise in attendance. Many of those spirits take cues from the Pokémon they represent. There’s even a Slowpoke master spirit that uses Amnesia to “teach” other spirits how to forget previously learned traits. Some spirits reveal their full potential when they’re enhanced at level 99. 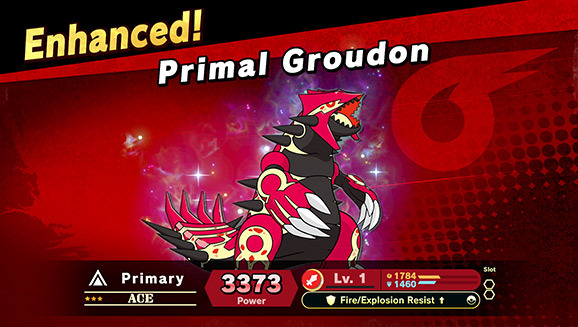 The Groudon spirit, for example, can become Primal Groudon when it reaches that milestone. Other Pokémon spirits can change forms, Mega Evolve, and more! To obtain most spirits, you must complete a challenge that’s inspired in some way by the spirit on offer, often under some especially creative battle conditions. 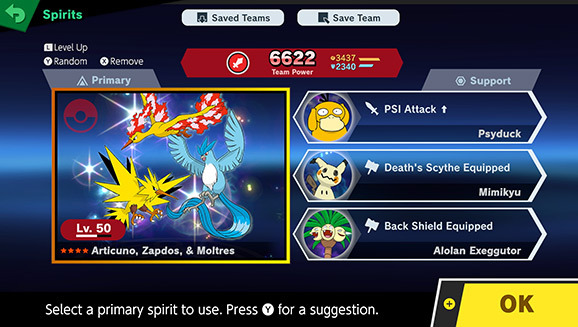 For instance, to unlock the Detective Pikachu spirit, you’ll need to do some detective work to identify and defeat the correct Pikachu out of a team of four within the time limit (of course, you can also obtain that particular spirit by scanning the comically oversized Detective Pikachu amiibo as well). The sheer abundance of Pokémon spirits to collect is itself an embodiment of what Pokémon is all about, and it’s this level of dedication that Super Smash Bros. Ultimate excels at. Super Smash Bros. Ultimate is also brimming with Pokémon references and creative homages. For example, the single-player story mode, World of Light, is full of exciting Pokémon surprises. Most of the time, you’ll move around the overworld map on foot, but you might also get the chance to cross a sea upon the back of a Lapras. In the game’s Classic Mode, each fighter follows their own path to face off against a unique sequence of opponents, and Pikachu’s route is a prime example of one that provides a distinctly Pokémon experience. In the aptly titled “I Choose You!” route, you’ll duke it out with each of the other Pokémon fighters on battlefields well suited to them. Many of the Pokémon levels available are loaded with Pokémon, and keen-eyed players might even catch some rare cameos. Although Super Smash Bros. Ultimate doesn’t introduce any new Pokémon stages, nearly every arena in series history is within reach. Be sure to check out treacherous locales like Saffron City and the Unova Pokémon League, where Pokémon do their best to cause chaos. In Saffron City, for example, you’ll want to be wary of mischievous Pokémon like Electrode, who seems to appear when you least expect it to use its Explosion attack. 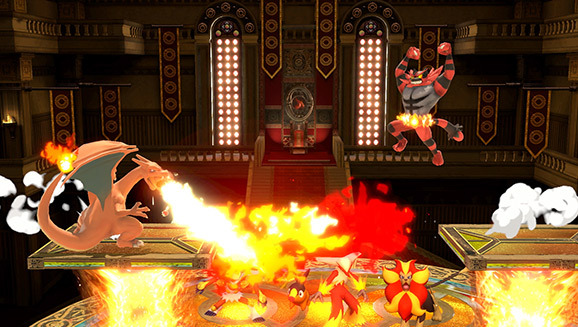 Some stages such as the Kalos Pokémon League also feature Pokémon spectators that are just as content to observe the battle. Many of the Pokémon levels available are loaded with Pokémon, and keen-eyed players might even catch some rare cameos. It wouldn’t be Super Smash Bros. without the iconic Poké Balls and Master Balls that players can use to summon Pokémon allies. Pokémon originally discovered in the Alola region as well as Alolan regional variant Pokémon are making their debut this time around. 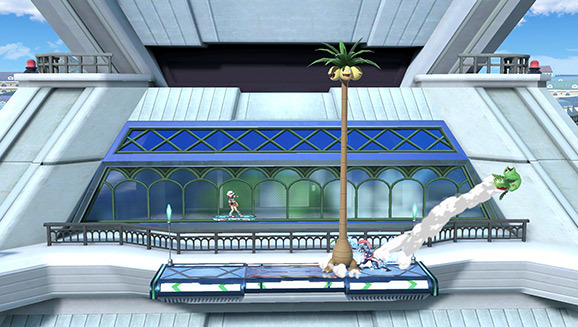 One of our favorites is Alolan Exeggutor, which, seemingly oblivious to the conflict at hand, divides the stage with its ultralong neck. Also, be on the lookout for Legendary Pokémon like Solgaleo, which darts around the stage with its Sunsteel Strike, and Lunala, which fires its Moongeist Beam at competitors from the background. True to its title, Super Smash Bros. Ultimate is an ultimate tribute to Pokémon. Even subtle touches go a long way to enliven the game with Pokémon essence, from the way in which Charizard and Incineroar take damage when submerged in water, to an arrangement of music tracks from throughout the Pokémon series. When details like these come together with other Pokémon elements, it makes Pokémon-on-Pokémon tussles feel that much more engaging. True to its title, Super Smash Bros. Ultimate is an ultimate tribute to Pokémon, and with such a staggering amount of Pokémon content available, it’s easy to imagine and assemble your own Pokémon scenarios and showdowns. Although the game contains an overwhelming amount of material from other franchises, its Pokémon offerings alone should keep you busy for quite a while.